I am back home from Berlin and Munich. My daughter and grandson and I left shortly after my spring open house to visit these 2 fascinating cities. I want to thank everyone who came to my March event. I didn’t have much opportunity to speak to anyone as I found myself working the cash desk. My friend who usually helps me out was in Hawaii and I gather having a marvellous time. The turnout was wonderful and I have to say that the show was swamped. So thank you again for supporting me and my work. And thank you to the wonderful friends who helped me this time. While we were in Munich, we visited King Ludwig’s palaces. Neuschwanstein is the one that the Disney’s castle is based on. It was truly amazing. Ludwig died under mysterious circumstances when he was 40. His really was a sad story. Munich is beautiful and we enjoyed ourselves very much. It is quite a wealthy part of Germany and also very expensive. We found that our apartment was in the midst of the high end shopping district. So we were surrounded by Prada, Gucci, Louis Vuitton – you get the picture. A food tour is always a must when we visit a city and the one in Munich took us to the local market where we sampled sausages, cheese, great bread and had flavourful liqueurs. But to reach our apartment we had to walk up the equivalent of 6 flights of stairs. A tip – always ask 0n what floor the space you are planning to rent is. From there we flew to Berlin. The pieces in the pictures have a wood core and are covered in lacquered paper. Very colourful. I have added a piece of furnace glass to the mix and you will see a piece or 2 made up of these components. I was able to find some unusual pieces while in Berlin. We spent 6 days there and stayed in East Berlin. More on that in my next post. Will also have pictures of what else I found while in Germany. You will be surprised at what there will be here in terms of loose inventory – and all at wholesale pricing. this is a very very small selection – citrine chips, faceted smoky quartz, amber, magnesium, vintage red metal beads, aventurine, goldstone, bone, copper, silvertone metal, turquoise, amethyst and the list could go on indefinitely. I had hoped to be neat and have everything organized but looks like it won’t be that way. Sold by the piece, by the strand. Lot’s is New – and Spring is still Coming! Besides having new work to show you, and some of it I am particularly excited about. 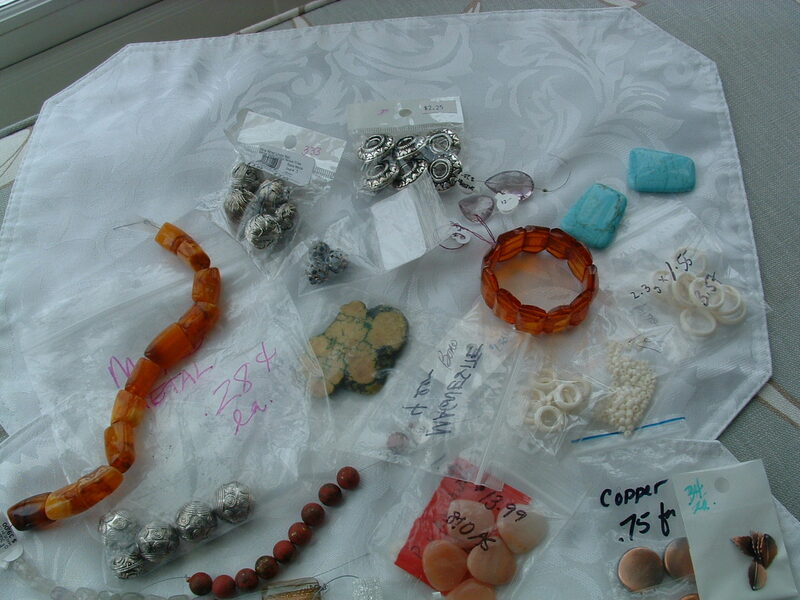 I have a selection of vintage and antique Saudi Arabian metal and silver beads. 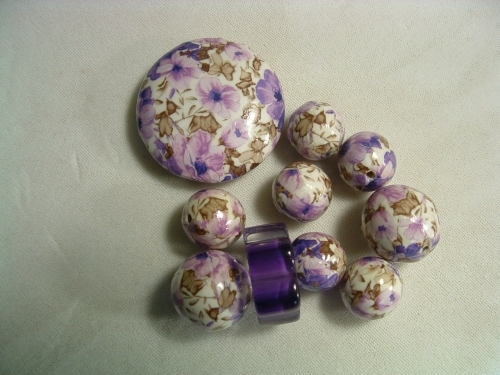 I have used the occasional piece as part of a necklace in the past. This time, I have polished and cleaned up some of these pieces so that the details can be seen. Each is hand made and was used originally as decorative bits for clothing or in jewellery. 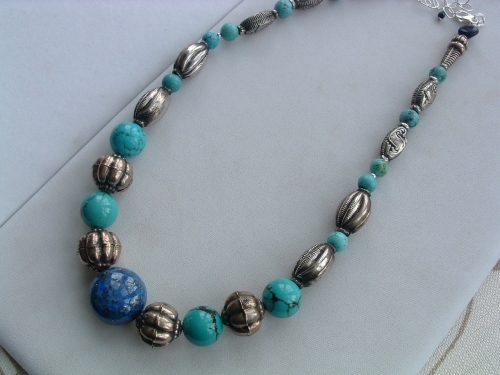 Pictured is a necklace of turquoise with a beautiful and fine lapis lazuli focal piece. I am working on a necklace with large coral. When you see middle eastern jewellery, turquoise, coral and lapis lazuli are often the stones used to complement the metal and silver beads. 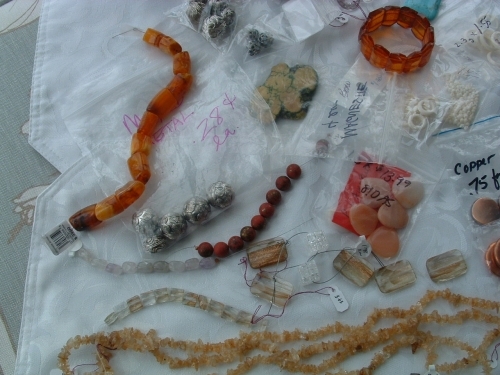 These colours and stones are also found in Native American Southwestern jewellery. New Work- Spring is Coming!!!! Amethyst Pendant that is faceted and wired with Sterling Silver. There are earrings in the same design. 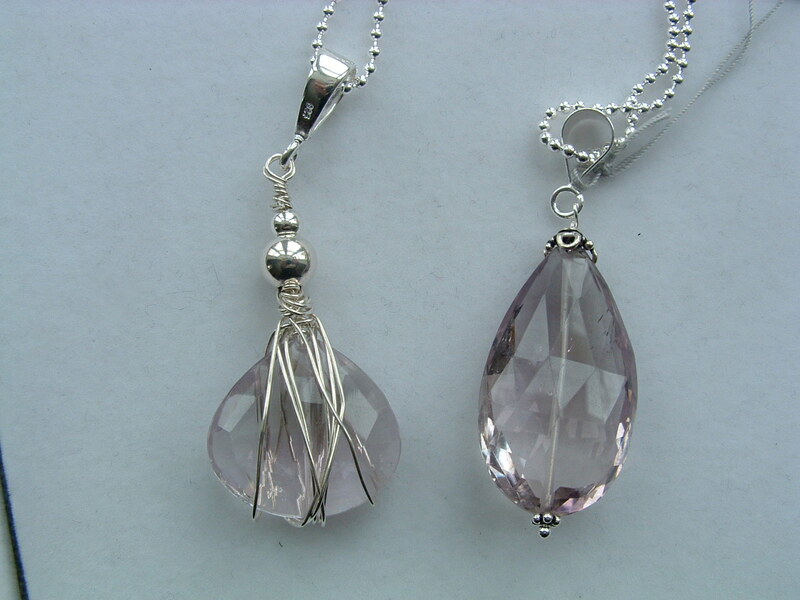 As well as pear shaped faceted amethyst in a more traditional shape. Both are lavender amethysts. Sometimes called pink. 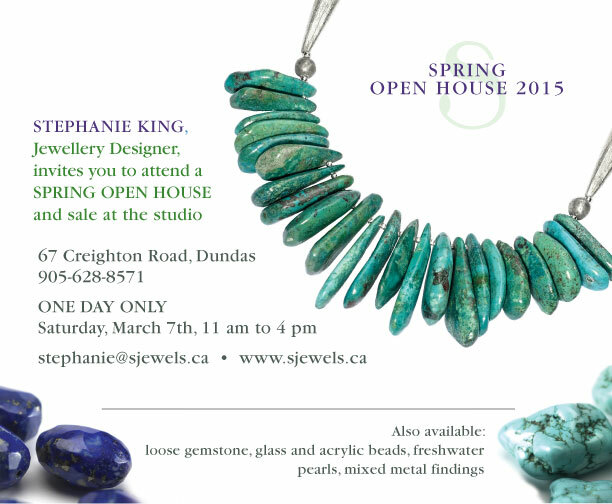 SPRING OPEN HOUSE AND SALE – JUST 5 DAYS AWAY!